Google is the best internet money earning source for bloggers and online money seekers.We want google but google doesn’t want us,it encourages bloggers untill and unless you are friendly with their policies and terms of services it will not care even if you are internet giant traffic source if you don’t obey your policy.In this post i am going to show you some methods how google finds you are clicking on your own ads and the final result is banning of Adsense notification from google .The above are some emails Some bloggers received who jumped for clicking on their own ads,and got caught. Now let us discuss few things how google comes to know that we are clicking on our ads,and also the steps we have to take care even not to get caught even we clicked on our ads for fun or money.”Don’t Click on your own ads even for testing ” this is the first statement generally google sends to every person when they give access to Adsense or approve their adsense accounts and also google promises and gives freedom to use one Adsense account on “N ” no of websites .It means you don’t have to wait untill 4-6 months for another Adsense approval.Google don’t bare Invalid or fraud clicking system because to satisfy their customers and for perfect results google ban the Adsense accounts who practice fraud clicks.There is an incident where Google banned my friends adsense account when he is going to draw his first 100$ in a couple of days ,at that time he was near around 97.2$ in his account because of his curiosity and anxiety to earn money made him dig his own pit.He clicked on his ADS 2-4 times so that his revenue gets increased even some couple of bucks ,and he can withdraw them as early as possible.The next day he say a Email from Google Adsense team saying that they banned their adsense account and they are returning all of his earned money to their publishers who faced illegal clicks.He got Messed up on reading that mail and lost all his 100$. Now how this happened and how does google came to know that my friend clicked on his own Ads,the ways to find are many less for google Adsense team because there are some billions of google adsense accounts to monitor . Google can find from where is your traaffic coming ,from where your blog is operated ,where are your backlinks etc…In such a manner google gives a seperate CLICKID no for every adsense account and also fro every AD.This helps google to find if the click is valid or not,these clicks get stored into a cookie and google shows to publishers whenever they demand . whenever you land any of the webpage google notes your average browsing time ,even what ares you are intrested in ,which places you are surfing.when your intenstion is to click on your own ads you go directly to your website as soon as webpage open you start clicking on your Ads.This makes google Bot Alert and send information to adsense team for verification . If the query sent by Bot came true then your adsense account is out of the game . There are some special tools available in internet which some bloggers used and got satisfied but their satisfaction doesn’t lasted soo far..This is called Clickbombing.This can be practiced by blogger who owns Adsense accounts or by other people who have Grudge on you.whatever be the reason you should be aware of those fraud clicks and install a good ANTICLICK BOMBING plugin if you are using WordPress . 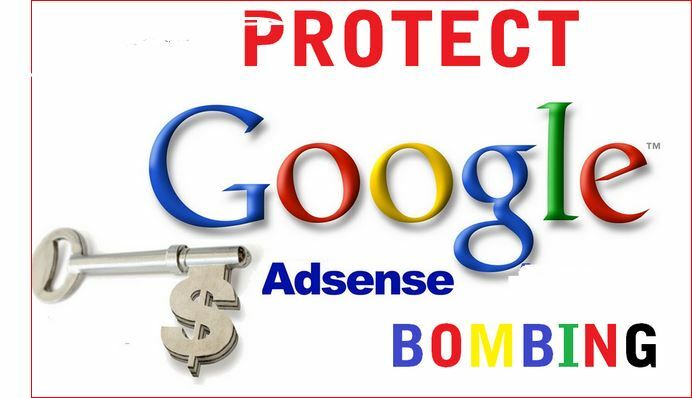 Google don’t seeks for replies or objections ,the security is in your hands and it is your responsibility .Click bombing is the biggest fraud in the sense of goggle and Adsense team blacklists those websites ans never give ay support to those websites by banning all google products to use. Using the help of ip address google finds the no of clicks from each Ip address ,if google finds someone is clicking on Ads continuously Google Intrusion detection systems can fire those Adsense accounts.This happens when bloggers exchange their clicks in some famous social accounts ,you can see some groups in Facebook especially requesting “PLEASE CLICK ON MY ADS ,I WILL CLICK YOUR IN RETURN”.This is very dangerous because the both are clicking on each other ads frequently on each of their pages from same Ip address and without any time limit.Remember that No person comes to website for just clicking on ads .This is where google finds those click fraud culprits and permanently Ban them. Google main source of Income is from ADS and from publishers .If a publisher pays 1$ for each view 0.65$ is owned by google and remaining 0.45$ for advertiser .This is the best Deal .If we bloggers are going to poke around those things google won’t let you do it. You can actually click on your Ads but must be very cautious while clicking on own ads.follow these steps to be safe and earn couple of bucks. 1.whenever you open your website don’t click on ADS while you logged into your WordPress account.This is big evidence for google that you had clicked on your own Ad.Because you are the admin of particular website where you have logged in and clicked on your Ads ,cookies stored in your computer browser will reveal that the time you logged into your WordPress account mean while ads have been clicked from same Ip and same browser. If you want to click on your Ads then completely logout from WordPress account and open browser in INCOGNITO mode then click on your Ads. 2. Never click on Ads directly once landed on webpage,give some time to browse or leave your website steadily for sometime even for 5 minutes then click on any of Ads,and again browse for 2-3 minutes jump into other post then click on to other Ad,not related to first ad you clicked .this will make your clicks Genuine. Never let your clicks invalid ,invalid clicks are even not paid.Google counts to those clicks which have been totally loaded.It means you have to jump from your website to website of the ad.If the AD publisher pays very high CPC for google then it will makes you some difference in your adsense revenue.In this way you can try upto 3-5 Ads for a day. If more than 5 ADS clicks are needed then regularly change your Ip address for every 15 minutes and spoof your MAC ADDRESS too.